Unlike many childhood hobbies, model railroading is something that can carry on into adulthood. Trains have an intrinsic magical allure, and enthusiasts will tell you that once you?re hooked, it?s hard to break away. Manufacturers looking to entice the younger generation into model railroading have taken steps to make trains that are easy to assemble and operate, are durable and?pardon the cliché?include a lot of bells and whistles. Potential customers will find it?s a buyer?s market when it comes to model trains, according to Loren Potts, manager of Depot Train & Hobby in Cleveland, Ohio. First-time buyers will find a wide variety of high-quality, durable products. ?Precision engineering and fine-scale detailing at an affordable price are what makes a high quality model train,? notes John Morath, communications manager for Bachmann Trains. ?Our commitment to these principles is what makes our sets stand out.? Nicholas Ladd, director of sales for K-LINE Trains, points out that his company includes many extras with its starter sets. The quality of craftsmanship is high, too, he says. ?Our starter sets are not just a loop of track and a small transformer,? Ladd notes. ?We only use our top-of-the-line O gauge SuperSnap track, which is easy for a young engineer to set up and take down. We distribute the largest and most powerful transformer in any starter set in the market. This allows the addition of extra track, accessories, switches and rolling stock without the necessity of purchasing another transformer.? Popular culture draws younger buyers into the toy train market, as well. One of last year?s bestsellers was Lionel?s O Gauge Polar Express Train Set, inspired by the popular holiday movie. Many hobby shops couldn?t keep them in stock. Sales are expected to continue to be high this year, thanks to the November release of ?The Polar Express? on DVD. Also for the 2005 holiday season, Bachmann will be offering its HO scale Grinch?s Whoville Special. Another popular train that has seen success because of media exposure is the HO scale Thomas the Tank Engine set manufactured by Bachmann. 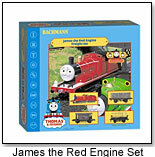 This year, Bachmann is introducing some add-ons to the Thomas set, including the James the Red Engine Freight Set, Gordon the Big Express Engine and Henry the Green Engine. ?We hold exclusive rights to HO scale Thomas & Friends electric trains in the U.S. and Canada,? Morath explains. ?Other companies (such as Lionel) hold licenses for other scales and/or other territories.? Interest in toy trains runs high during the holidays, as people buy them to place under their Christmas trees. But, of course, for many enthusiasts, trains are a year-round hobby that doesn?t end when the holiday decorations go back in storage. What follows are some of the popular trains for first-timers, according to retailers. This ready-to roll set features a train full of construction-oriented and operating rolling stock compatible with O and O-27 gauge trains. The oval layout includes easy-to-assemble SuperSnap Track. The engine is an accurately detailed MP-15 diesel with operating horn sound and beacon. Freight cars include a gondola, working caboose, flatcar and operating log dump car. It also includes construction vehicles, construction and railroad signs, figures, barrels, transformer and hook-up wires. This O gauge set brings to mind memories of the popular book and movie, in which a group of children have the chance to ride a train on Christmas Eve to the North Pole to meet Santa Claus himself. It includes a steam locomotive and tender, two passenger coaches, one passenger observation car with rounded deck, track, transformer, articulated movie characters, air whistle, operating headlight and interior lighting. This ready-to-run set includes Thomas the Tank Engine with moving eyes, Annie coach, Clarabel coach, Bertie the Bus, Harold the Helicopter, a Sir Topham Hatt figure, 56” by 38” of oval track and a power pack. Young children who are familiar with the Thomas television show and movie will enjoy this easy-to-use HO Scale set. This O gauge set includes a steam locomotive and tender, boxcar, gondola with four canisters, caboose, track and transformer. It has forward, neutral and reverse selections, a die-cast body and frame, traction tires, headlights, electronic whistle, opening doors and a smoke unit, complete with smoke fluid. The patented FastTrack snaps together easily. The track dimensions are 40? by 60? when assembled. This N scale set is a replica of the actual train that runs through the Alaskan wilderness. Passengers sit in dome vista cars that give them access to breathtaking views as the train runs through Denali National Park. The set comes with a powered EMD F9 diesel locomotive, unpowered EMD F9 unit, three full-dome passenger cars, 34” x 24” oval of track, a power pack and speed controller. Warbonnet Express by ATHEARN INC.
Other products from ATHEARN INC. This highly detailed train has exquisite prototypical decorating. The locomotive is powered with a five pole dual flywheel motor. All cars have machined wheels and knuckle couplers. The oval track is made of nickel silver and is easy to assemble. It comes with the following features: A UL Listed Athearn TrainPak power pack, three cars, one caboose and a bonus Genesis box car. Trainline Power Pro Diesel Freight Set by WM. K. WALTHERS, INC.
Other products from WM. K. WALTHERS, INC. This set, designed especially for beginning model railroaders, includes a GP9M diesel engine with a working headlight. The set also includes a caboose, flatcar, trailer, coal porter, gondola, boxcar and single dome tank car. Also included is a 36? x 54? oval of track. Crafted for those who have recently graduated from beginner train sets, this five-piece set includes a 41" x 61" track layout. It also has a diesel engine with horn, an operating dump car, a gondola car with four crates, an operating crane car and a working caboose. In addition, it comes with a 120-watt transformer.